Mike here. I bake stuff. 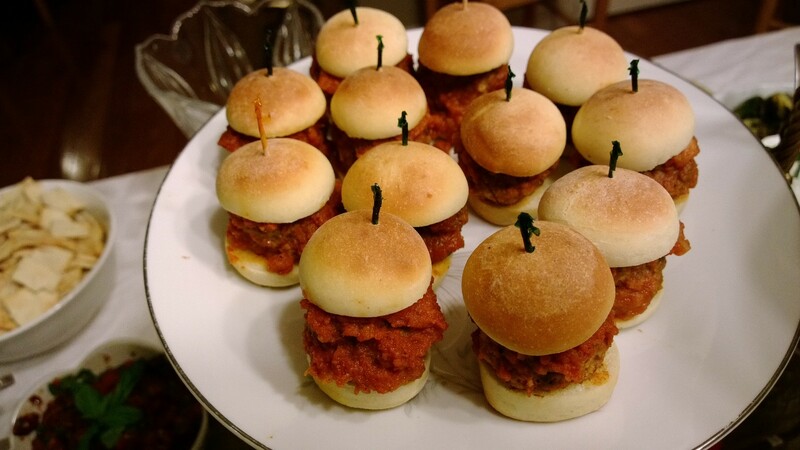 These are the mini buns that Kristina used to make sliders with her smoked mozzarella meatballs. I like to make my own slider buns because it’s so hard to find fresh bread of the appropriate size and texture. Don’t settle for stale dinner rolls as sliders! This recipe is based on the Gourmet cookbook’s recipe for hamburger buns, and whatever shape you bake them into, they are hands-down the best buns for burgers, pulled pork, or anything juicy, because they are soft but do not get soggy. This is all it takes – sugar, flour, milk, eggs, butter, and yeast. 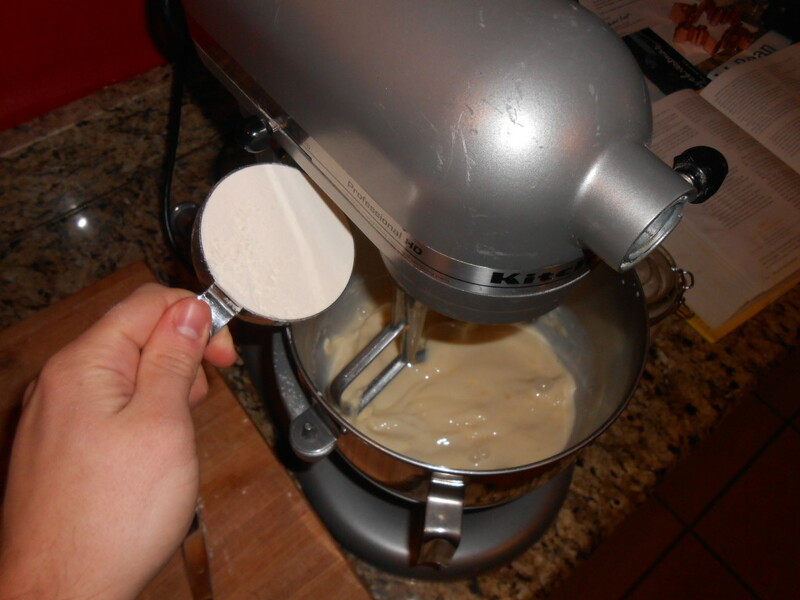 I use the KitchenAid stand mixer to do all the mixing and kneading. 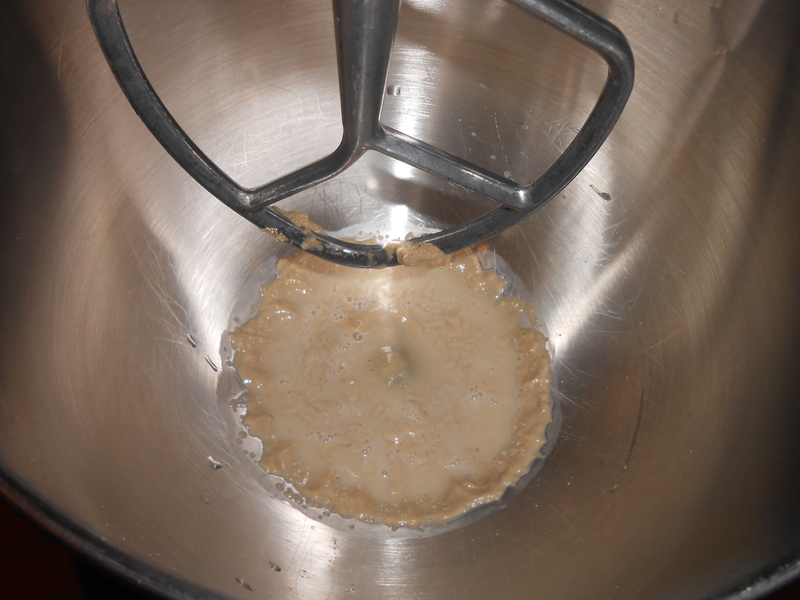 Put 1/4 cup of warm water in the bowl of the mixer, add two packages of active dry yeast and a half teaspoon of sugar. Let it sit until it starts to get foamy, so you know the yeast is alive and ready. I’m usually too impatient to let it get to a full heady froth, and continue once I can tell it’s doing something. While waiting for the yeast, heat up 2 cups of milk until warm (~115F) and soften 1/2 stick of butter. When the yeast is ‘ready’, add the milk, butter, and 1/4 cup of sugar and turn the mixer on low speed with the paddle attachment. Let the mixer stir until the butter is melted. If it’s a really cold day or the butter is not soft enough, it may not finish melting. I’ve had this happen and just continued through it. You just don’t want giant hunks of hard cold butter in the bowl at this point. 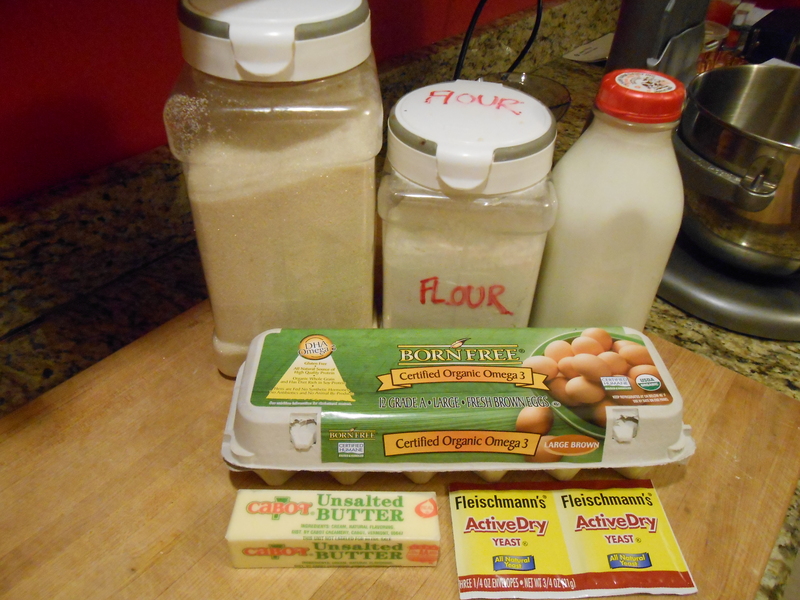 Add two eggs and a tablespoon of salt and mix until combined. With the mixer still running, add 4 cups of flour, one at a time. Scrape down the sides if you need to. I find that it manages to mix OK on its own. It should look like a thick sticky batter. That means it’s time to switch to the dough hook. Put on the hook, set to low speed (2) and add 2 cups of flour. Let it knead until the dough pulls away from the sides of the bowl and climbs the hook. You’ll probably need to add more flour for this to happen. 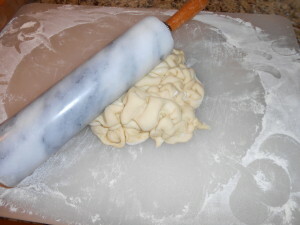 Add one tablespoon at a time, up to another full cup, until it turns into a sticky dough that the hook pulls cleanly away from the sides and up the hook. Then leave it kneading for 5 more minutes. Oil a large bowl, turn out the dough into it (dough will be sticky and you may need to dig the few remaining bits out of the bottom of the mixer bowl). Cover with plastic wrap and let it rise until doubled. 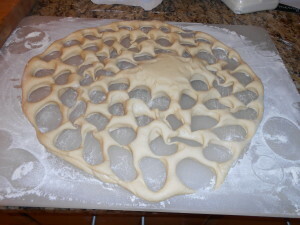 Once the dough has risen, flour a large cutting board or clean countertop. Turn the dough out onto the surface and with a rolling pin, roll it evenly about one inch thick. The final buns will be about twice as tall as whatever thickness you roll this out to, so you can vary the thickness somewhat depending on what you want. For sliders, make sure they’re not thicker than they are wide, otherwise they’ll fall over when they bake! 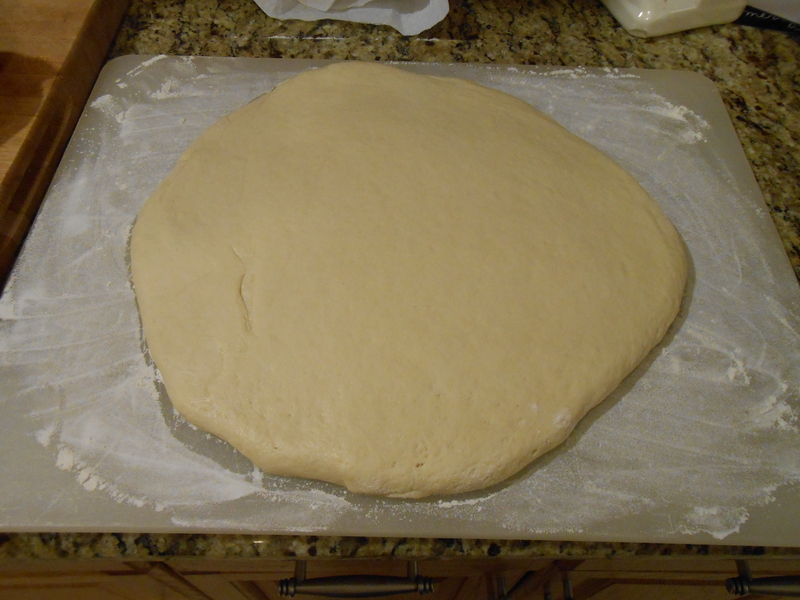 Now for the fun part – cutting out little buns from this big flat piece of dough. Ever see one of those 15-piece biscuit cutter sets and wonder “What the heck am I going to do with a 1.25″ biscuit cutter?” This is it. If you don’t have small biscuit cutters, find something a little smaller than the size you want for your sliders (to account for rising). In a pinch, a thin-rimmed shotglass, juice glass, or empty tomato sauce can will work. Line the dough rounds up on a greased baking sheet (or parchment-lined for no-cleanup), about one inch apart. 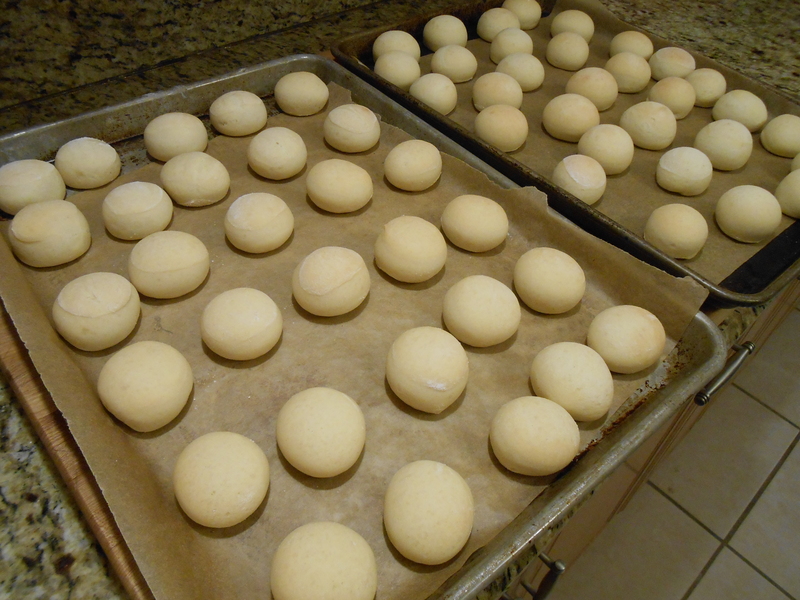 Once you’ve cut all you can from the dough, gather it up into a ball and roll it out again. You’ll be able to get a bunch more out of it, and they come almost as good as the first cut. Cover the buns lightly with plastic wrap and let rise again for a half hour. Larger or full-size buns will benefit from a longer rise here, up to 2 hours. Prior to baking, you can also brush with some milk or egg and sprinkle sesame seeds to make them look more burger-y. I find that this just makes a mess and the seeds fall off. These are good enough without them. Bake at 375 until they just start getting golden – about 14 minutes. You can put two sheets in the oven at once, just switch positions halfway through. Let cool. They can be used right away, but they also keep well frozen in a freezer bag for several weeks. One recipe will make about 100 small slider buns (about 20 full-size). I ended up with 97, partly by coincidence and partly because I got impatient and baked the last dough bits into one big lump to eat with butter hot out of the oven. Slice in half and make into awesome sliders. These buns will hold up against just about anything you put in them without falling apart, yet still be deliciously bready. The best slider and burger bun recipe, for soft sturdy buns that can stand up to a juicy burger or pulled pork. 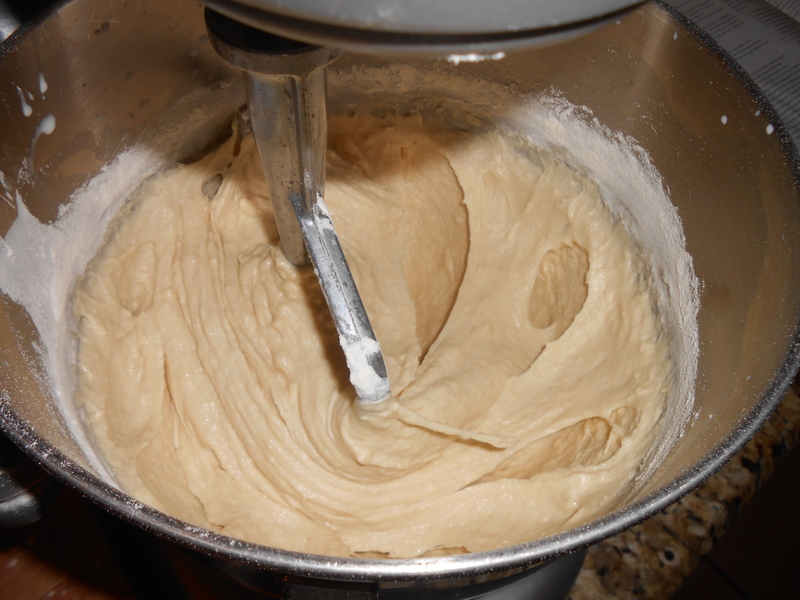 Put the yeast, ½ teaspoon sugar, and ¼ cup warm water in the bowl of a stand mixer and let sit until it starts to foam. Warm the milk, soften the butter, and add both to the mixer bowl. Mix on low speed with the paddle until combined and the butter has melted. Add the eggs and salt, and mix until combined. Add 4 cups flour and mix until combined into a sticky batter. 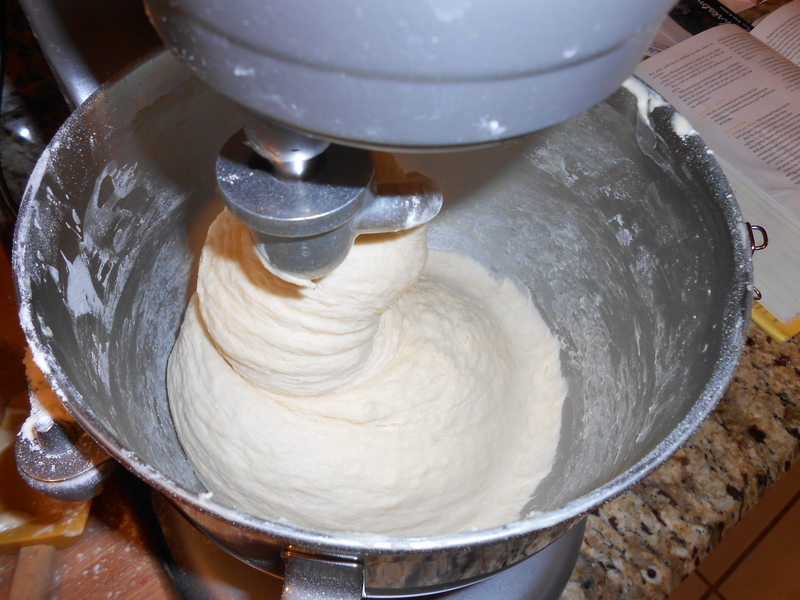 Add 2 cups flour and mix with the dough hook until it pulls away from the bowl and climbs the hook. If dough is too loose, add more flour one tablespoon at a time, up to another full cup. Knead for another 5 minutes. Dough will be sticky. 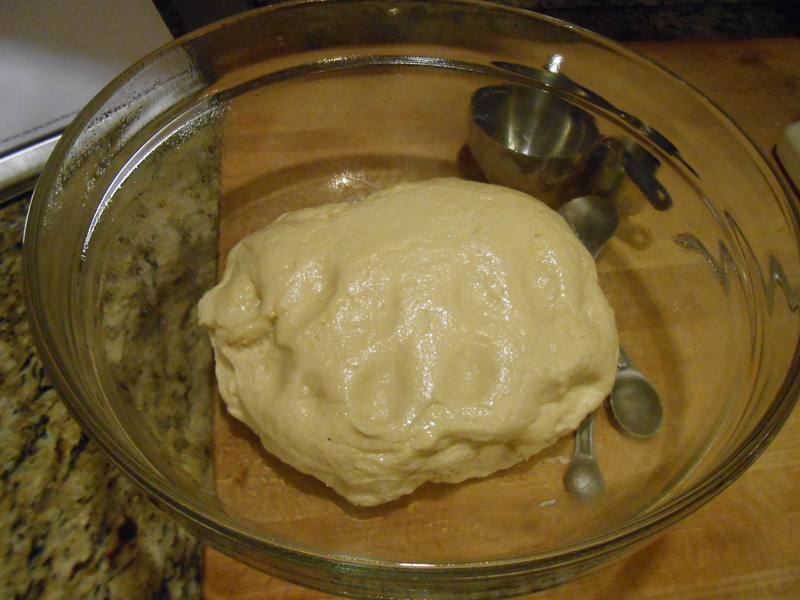 Turn dough out into an oiled bowl, cover with plastic wrap, and ride until doubled, about 2 hours. Flour a large board or countertop. Turn out dough and roll out to one inch thick. 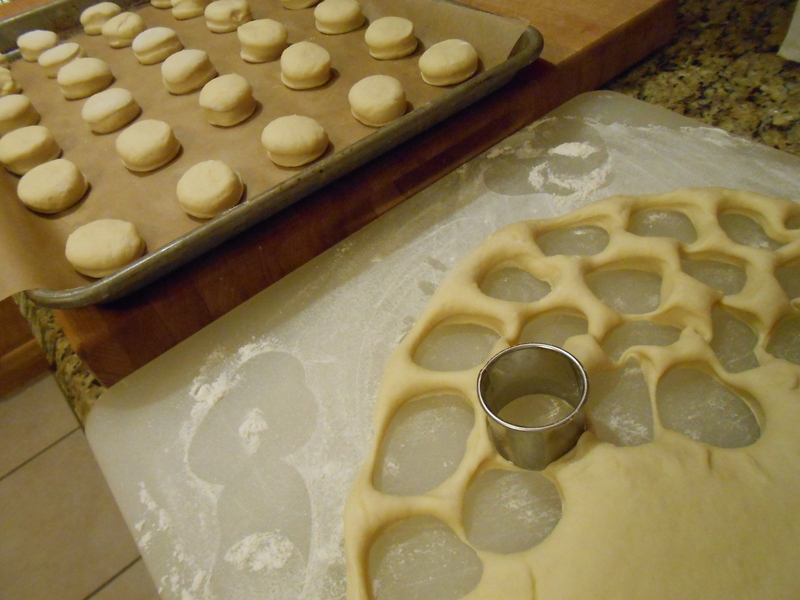 Cut buns from dough with a biscuit cutter. Place cut buns on a greased or parchment-lined baking sheet. Gather up extra dough and roll out again to make more buns. Cover sheets with plastic wrap and let rise again until they start to puff a little, 30 minutes to up to 2 hours. 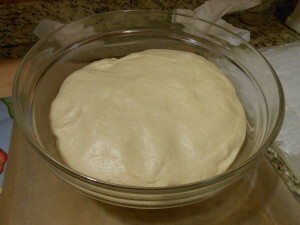 Bake at 375F until just goldern, about 14-20 minutes depending on bun size. This entry was posted in Cooking, Guest Posts, Recipes and tagged baking, buns, sliders. Bookmark the permalink.